Carla Vigil is a born and raised Taos native and is now raising her family on the same land her Grandfather passed down to his children and grandchildren. Carla has 2 daughters who teach her daily about love, patience and kindness and a partner who is endlessly supportive. Carla enjoys reading, spending time with family and supporting her girls in their various activities (a.k.a. built-in entertainment). 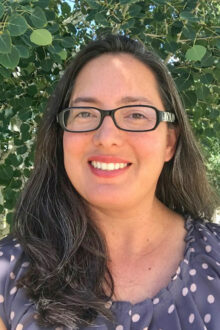 Carla graduated from New Mexico State University with a Bachelor of Community Health and has served families in the Taos community for 18 years in Family Nutrition, Feeding Relationships, and Breastfeeding Support and most currently in Home Visiting offering families support in Parenting, Child Development and Reflective Practice. Carla is a certified facilitator of ‘Circle of Security Parenting’ and ‘Parenting with Love and Logic’ curriculums and has a Level 2 Certification in ‘Facilitating Attuned Interactions (FAN Approach)’. Carla conveys a profound gratitude for her co-workers and families in Home Visiting as they support her as much, if not more, in her work, her own parenting and personal growth.